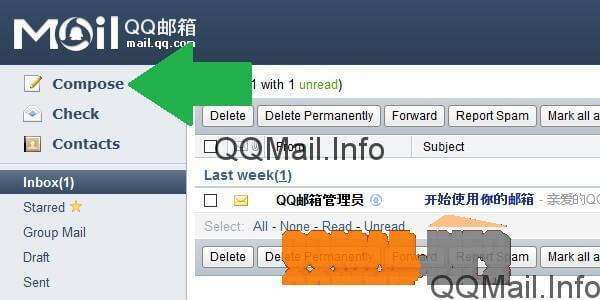 Once you know how to log in and out of your QQ mail account, the next step is to learn how to use its basic functions: sending an email message, and how to attach different types of files. 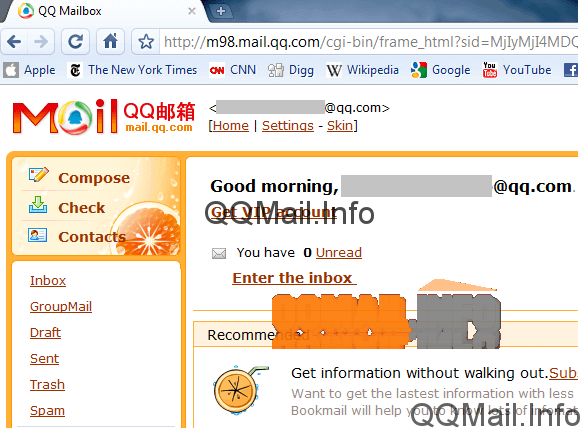 QQ mail has a very clean interface that makes all of this very simple. In this post, we’ll walk you through each of these processes step by step. First, start by logging into your qqmail so that you are looking at your inbox, and we’ll go from there. First, let’s learn how to send a basic email in qqmail. Look over to the left menu bar in your QQ mailbox. At the very top, there should be a button to “Compose” a new email message, with a little picture of a pencil and notepad next to it. Click on “Compose”. This will take you to the page where you will write your new email and indicate who you want to send it to. The first field that you can fill in on this page is the “To” field, which is who will be receiving your email. Type in the email address of the recipient or recipients into this top box. Next, you can enter a subject so the recipient knows what the message is about before they open it. This isn’t required, but it is recommended for good email etiquette. One cute thing about QQ?? is you are able to change the color of the text in the subject line. Now, I imagine this color will only show up to people who are also using QQ Mail, but if you want to give it a try, just like on the tiny color palette on the right-hand side of the subject line. You can choose from orange, green, purple, or the default color, black. I went ahead and chose purple. Isn’t that cute? Now, you can go ahead and write the body of your email in the big box labeled “Content”. This part is up to you, and you can say whatever you want or need to say to your contact. Of course, your email will be written with a different tone depending on whether you’re writing to your boss or buddy from college, but good email etiquette is good in any situation (e.g. don’t overuse all-caps – it looks like you’re shouting). When you are satisfied with your message, all you have to do is click on the “Send” button. There is one at the top of the page and another one at the bottom, and you can use either one. And that’s it! 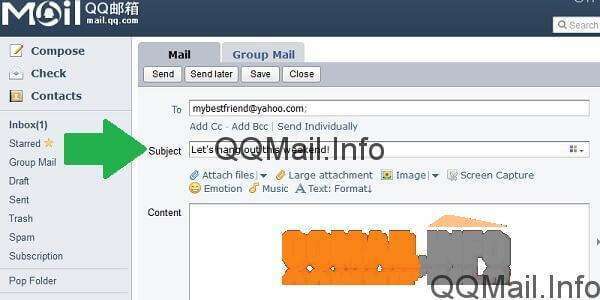 That’s all it takes to send a basic email in QQ Mail. Read on to learn how to attach files, pictures, and videos to your email messages. 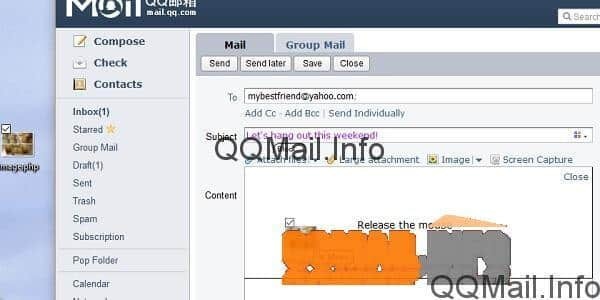 If you want to send a file to the recipient of your email, qqmail has a very simple way to do that. First, let’s rewind to the part where you had already indicated who will be receiving the email, the subject, and composed the body of the email. Now, to attach any type of file that’s less than 50 Mb, all you have to do is click on the link that says “Attach files” next to a small paperclip icon. 50 Mb is big enough to accommodate most text documents, like Word doc or PDF, as well as small or low-quality image files. This will open up your computer’s file explorer, where you will need to browse for the file you want. Where you go here will depend on where you saved the file you are going to attach. If you aren’t sure, good places to check are “Desktop” and “Documents”. When you find it, click to select, and then click “Open” in the file explorer to attach it to your email. You’ll know that the attachment is there because right above the “Content” of your email, there will be a tiny paperclip with the name of the file you attached. 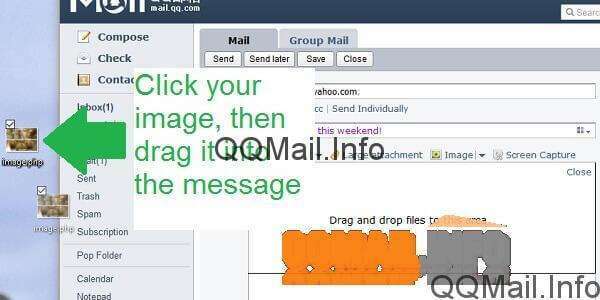 You can use this exact process to attach an image or picture to your QQ Mail email. Watch how I will click “Attach file”, and browse for the desired image in my file explorer. Now, you can see that my image is attached. 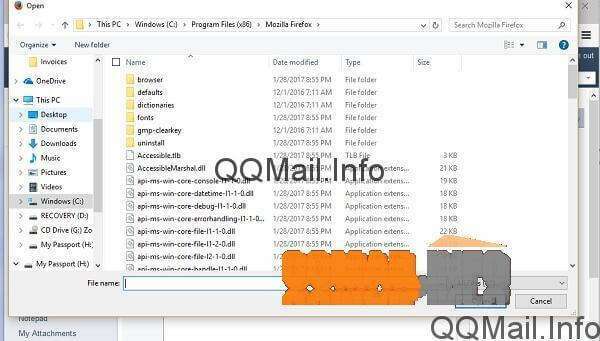 There is another way to attach a file or picture to your message in qqmail that is helpful if you have your file on the desktop, or if you don’t know exactly where on the computer the file is but you have it open in an explorer window. For files that you just downloaded from the internet, this could be a good option. Basically, you’re just going to “drag and drop”. Click and drag the file or picture you want into the body of the email, and then release the mouse to attach it. Tadaa! As you can see, the file is uploading and will be attached and ready to send in just a few seconds. Video files tend to be on the large side, and some email programs aren’t able to send them as normal attachments. 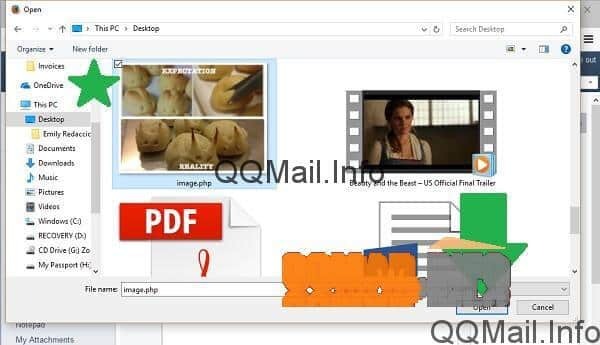 QQMail has the ability to send some video files the normal way, but it also has a special option for large attachments. For example, I have this video file on my desktop that I want to attach to my message. I’m going to drag and drop it just like before. And when I do, this message pops up saying that my attachment is over 20 Mb. QQMail recommends sending this as a large attachment, although since it’s under 50 Mb, you can still send it normally. If you send it as a large attachment, it will be stored temporarily so your recipient can download it, and then it will be removed so it doesn’t waste space in your email. If your video file is larger than 50 Mb, you’ll have to send it this special way and won’t have the option to send as a normal attachment. After you’ve attached whatever files you want, all you have to do is click the “Send” button and your email will be on its way to the recipients you indicated. 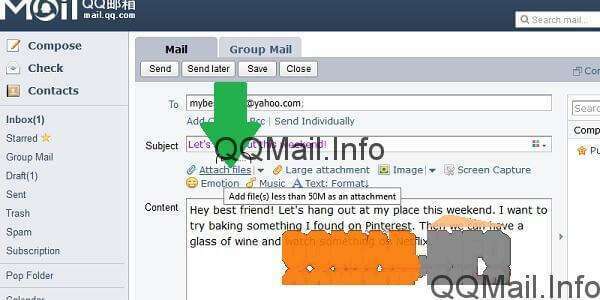 Overall, sending messages and file attachments in QQ Mail isn’t very different from most other email platforms. Once you’ve done it a couple times and get the hang of it, it will be a piece of cake and you won’t even have to think about what you’re doing anymore. Now that you’ve signed up for your QQ Mail account, it’s time to learn how to sign in and out so you can access your email from any computer while still protecting your information from other people on shared devices. You might remember that the sign up process for qqmail was quite involved because you had to do an account verification via text message AND by clicking a confirmation link in your primary email. Well, the fun ain’t over yet, because the first time you try to sign in to your qqmail, things will be a little weird. But don’t worry, I’m here to walk you through each step. 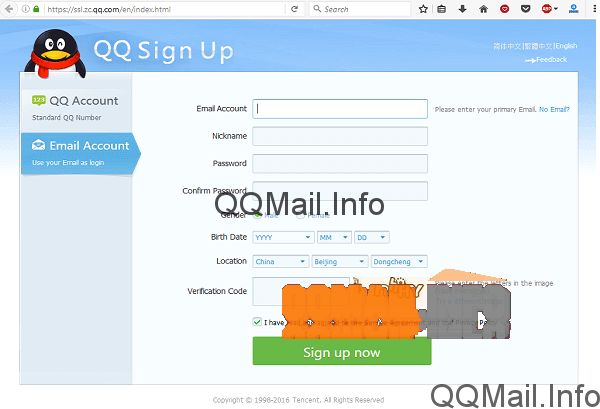 First, you’ll need to go to the login page for QQ Mail. Remember that this is a Chinese email service, so you’re going to want the English version of the sign in page. 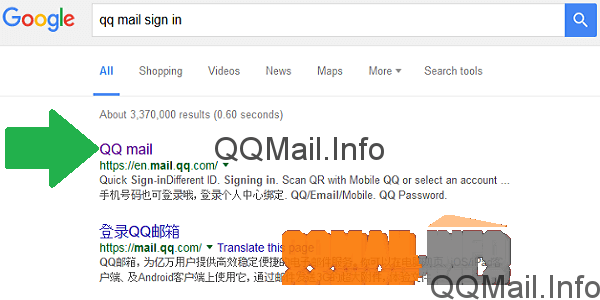 To get there, you can Google “qq mail sign in”, and your first result will be the English login page. Note the “en.” at the beginning of the URL – that stands for “English”. This is what the sign in page for QQ?? looks like. I imagine they change the quotation periodically, so you might see something slightly different. Here is a close-up of the URL in case you prefer to type the web address in directly, rather than going through a search engine like Google. It’s fairly simple to type in manually, and your internet browser will probably remember it the next time you want to sign in. At this point, you’ll sign into your qqmail just like any email account. In the first field, type in your primary email address (i.e. the one you used to sign up with, like Gmail or Yahoo). If you saved or wrote down your QQ ID number after you set up your account, you can type that in instead. 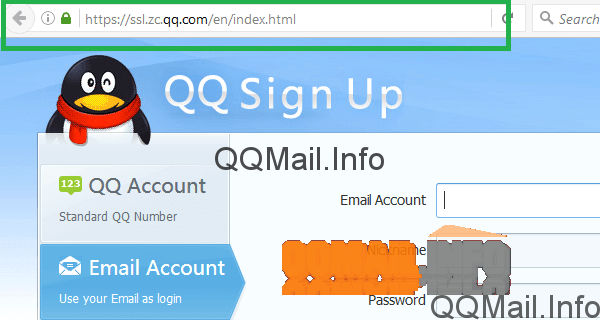 However, if you try to sign in the first time with your QQ Mail email address, which is your QQ ID followed by “@qq.com”, it probably won’t work. Then, type in your password and enter the captcha code if necessary. At the bottom of the login box, there is a little checkbox that says “Remember me”. If you are using your own private computer, checking this box is convenient because it lets you stay logged in all the time until you log out manually. But if you are using a computer that other people have access to, we recommend leaving this box UNCHECKED. Ok, here’s the weird part about your first time logging in to qqmail. It’s going to ask you to “activate” your email. Isn’t that what I did when I entered the verification code from my text message and when I clicked the confirmation code in my email upon sign up? Well, apparently not. 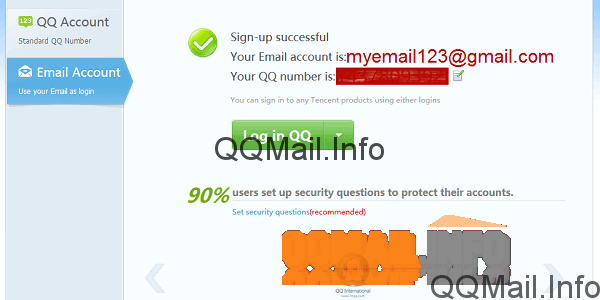 That set up your QQ Number, but now you have to confirm that you actually want to use your email. Don’t worry, this only happens the first time you log in. 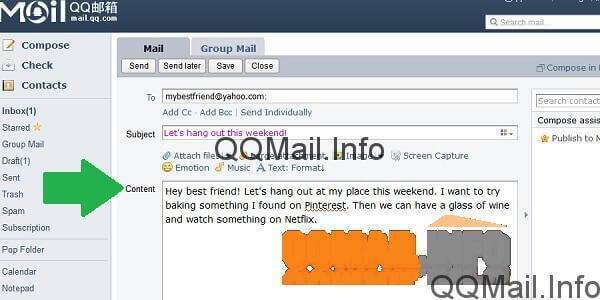 Next QQ is going to ask you to share the news with your friends about your new qqmail email. Except, you probably don’t have any QQ friends yet. So, the only option you have here is to “skip”. Again, this is something that you only have to do the first time you sign in. Now you finally have a verified, confirmed, activated, bona fide QQ Mail email account. There are some notes about what your new email capabilities are, like storage space and file size for attachments. When you’re ready to go to your brand new inbox, click on “Enter My Mailbox”. Welcome to QQ Mail (but, like, for real this time). As you can see, your inbox layout is fairly simple. You have probably received a welcome message from QQ, and I sure hope there isn’t any life-or-death information in there, because it’s in Chinese. If you can read Chinese, you’re leagues ahead of me. Now, if you are using your own personal computer and aren’t worried about random people sneaking into your QQ Mail, there’s no need to sign out. However, if you’re on a shared device, it’s always smart to sign out of qqmail before leaving the computer. You can also sign out just so that you can sign in again and see that you don’t have to go through the whole “activation” rigmarole like you did the first time. Just find the “Sign out” link in the top-right corner and click on it. When you see this page, you know that you’ve logged out of your qqmail account. Now, just for fun, you can go back to the sign in page by clicking “Sign in again”. And from now on, when you log into qqmail, it will be the standard “username, password, go”. You might even be spared the captcha code if you’re on a computer that QQ Mail recognizes. 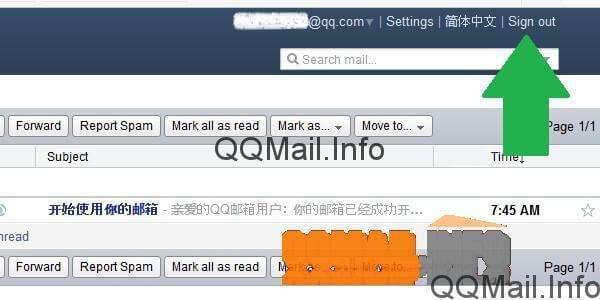 Oh, and if you’re curious about those Chinese characters up at the top next to “Business mail”… it will take you to the original qqmail sign in page in Chinese. So if I had to guess, I’d say that’s Chinese for “Chinese”. If you think you can handle things from here, have fun with your new qqmail email address! 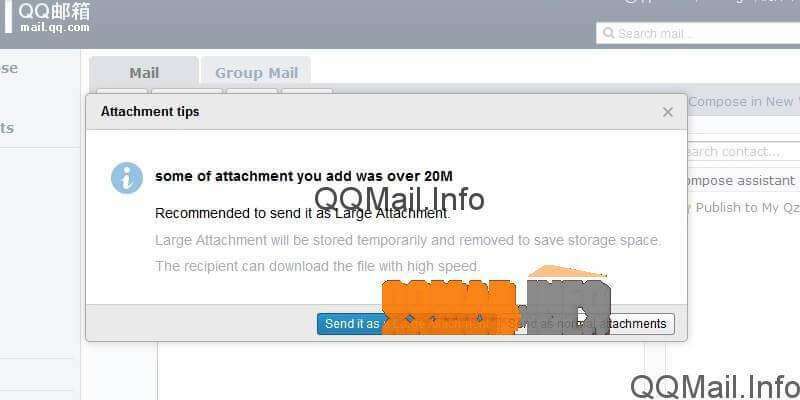 For a guide on using the basic functions of your new account, see our post: How to send a message, video, image or file with QQ Mail. 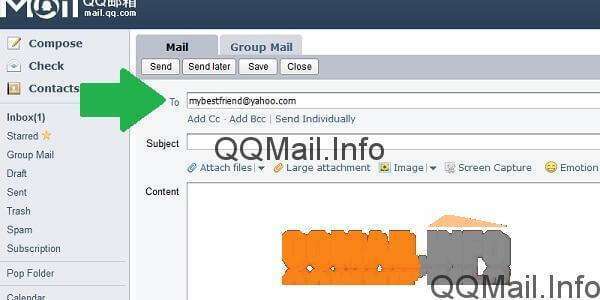 QQ Mail is one of the world’s biggest email providers and is associated with one of the world’s biggest social networks, but if you live in the United States, Canada, UK, Australia, etc. you may have never heard of it. That’s because QQ Mail (or qqmail) is a Chinese email service created to give residents of China alternatives to sites and services that are banned in that country. That doesn’t mean that only Chinese people can sign up for qqmail, though. In fact, it’s growing in popularity, especially among people who have business partnerships in China, penpals, or who want to find someone to practice their Chinese with. That being said, signing up for qqmail can be tricky for English speakers residing outside of China. 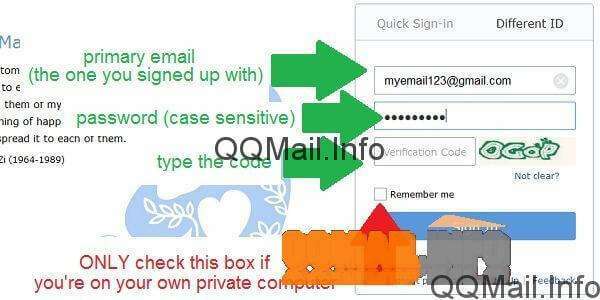 Here, we have a step by step tutorial for how to open a QQ Mail account in English. Now you need to fill in the different boxes with your information. In the first box, start typing your primary email address (e.g. Gmail, Yahoo, etc.). When you do, a dropdown menu will appear so you can select the domain for your email address (that’s the part that comes after the “@” sign). 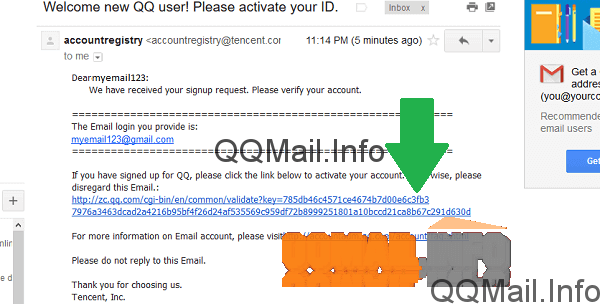 You should get a nice green check mark when QQ verifies that this is a valid email address. Continue by picking a nickname. It can be anything you want and it appears that it doesn’t have to be unique, since you’ll get a unique QQ ID number as your account identifier. Then, choose a password that meets the requirements stated in the little popup box, and enter it again to confirm it. The QQ?? sign up page will let you know how strong or weak your password is, but it will allow you to continue with a weak one (although this isn’t really recommended). Now, continue filling in the fields with your information, selecting your gender, birth date, and location. Finally, type the verification code in the box at the bottom to prove you aren’t a robot, make sure the box is checked indicating you’ve read the fine print, and click “Sign up now”. Now QQ Mail is going to send you a text message to your mobile phone for additional verification. IMPORTANT! If you just go typing your phone number in right now, it won’t work because it’s set to accept only numbers from mainland China. If your phone number isn’t Chinese, as it most likely isn’t, click on the link that says “select your country/region”, and then pick your country with the appropriate code from the list. After that, you can enter your mobile phone number and you should get a free SMS text message within a matter of seconds that contains a 6-8 digit code. Type that code into the box, and submit it. 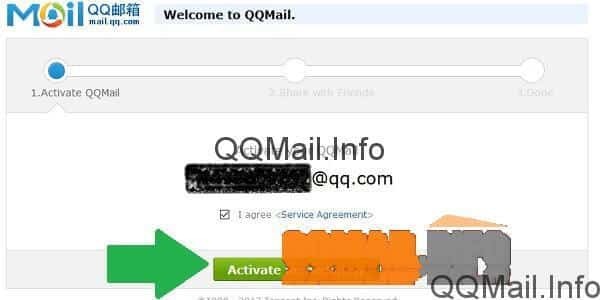 If it is the right code, you should be taken to a page telling you that QQ Mail sent an activation email to the address you used to sign up. Note: The first time I entered my verification code, I got an error saying I had tried to sign up too many times and I was blocked for 24 hours. I have no idea how this happened except that maybe something weird happened with my connection and it tried to send the page twice. Anyway, it worked today, so if this happens to you, don’t panic. Just try again the next day. Next, you need to check your email for the activation link. I used Gmail to sign up for qqmail and it was sent to my “Updates” tab, but your mileage may vary. Click the big ol’ link in the body of the email. Tadaa! 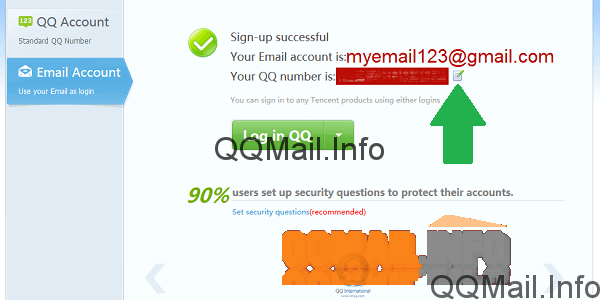 Your QQ Mail is all set up and you can log in by pressing the big green button. You can also set your security questions from this page, which is always a good idea. And here’s something neat. Instead of scribbling your new QQ number down on a post-it note that is going to fall off your screen and be lost forever, click on the tiny button that looks like a notepad next to the ID number. This will download a text file that you can open in Notepad. Depending on your browser, the computer may try to open it as an html file. That’s ok – if you get a popup that lets you select another program to open the file with, pick Notepad (for PC) or whatever program you usually use for .txt files. If you can’t, go into your browser’s downloads, right click the QQ number download and select “go to containing folder”. Then, from that folder, you should have the option to right click and “open with…” Notepad. You’ll get a cute little text file that says “Your QQ number is: **********”, which you can save to your desktop so that it’s always easy to find. And that’s it! 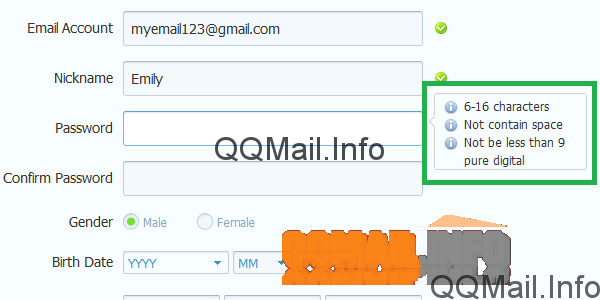 QQ Mail has a fairly simple interface, so you can go ahead and log in using the email/password combo you provided at sign up, or using your new QQ Number and the same password. Click around and explore, but don’t be terribly surprised if you run into some Chinese characters along the way. 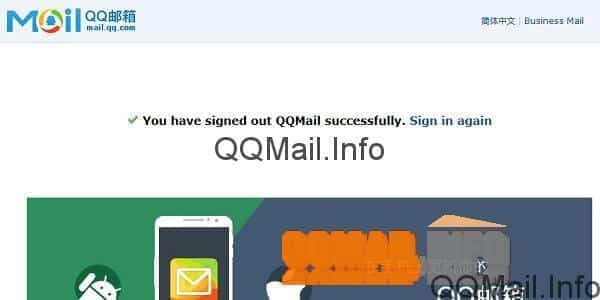 To learn how to sign in and out of your new qqmail account, check out our post: How to open and close a session in QQ Mail. 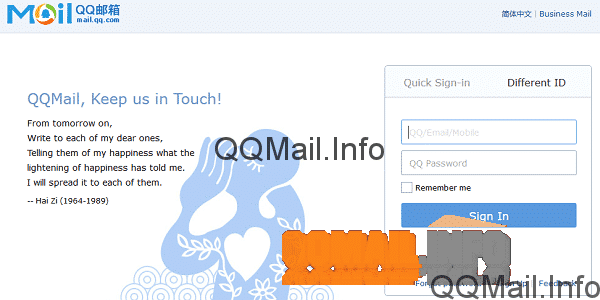 What is QQ Mail and what is it for? 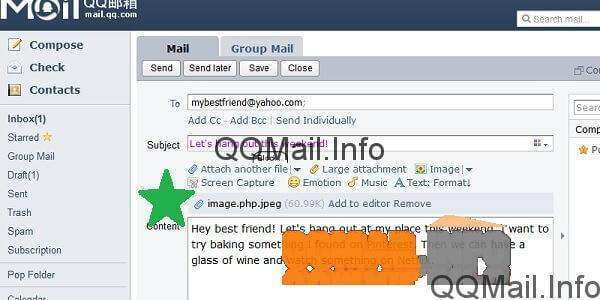 Most people in North America and Europe have never heard of QQ Mail, yet it’s one of the biggest email services in the entire world, comparable to Yahoo, and its associated social network QZone is second only to Facebook in terms of the number of active registered users. How can this be? The answer, in one word, is: China. Because so many websites that we take for granted here are blocked in China, they have no choice but to develop alternatives that are permitted by the government. 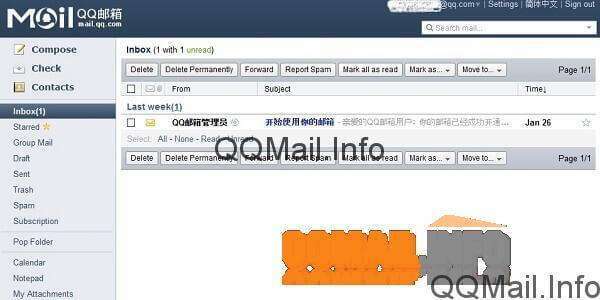 QQ Mail or qqmail is the country’s most popular free email platform, and considering China’s sizeable population, that allows it to rank alongside major services like Yahoo and Gmail. But qqmail isn’t just for people living in China – it’s become quite popular in countries like Japan and Korea, and as more and more businesses in Europe and North America begin to work with companies based in these Asian countries, it’s becoming increasingly clear that having a qqmail account makes these interactions much easier. 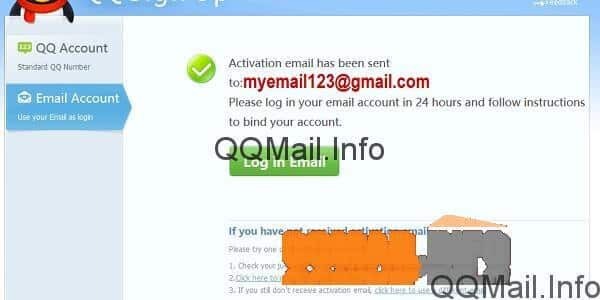 Basically, anyone who routinely is in contact with people in China would benefit from a free qqmail account, whether it’s for school, business, or any other reason. 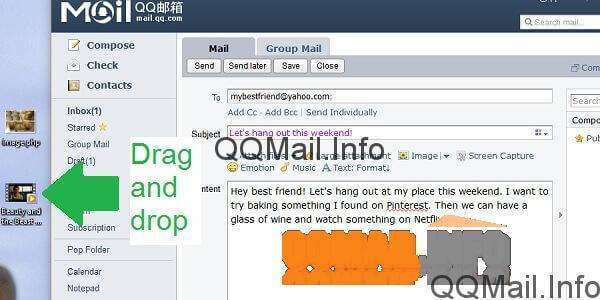 Even if you’re just interested in meeting new people in China because you’re trying to learn Mandarin, for example, getting a qqmail email address is a great first step to being able to reach people there. 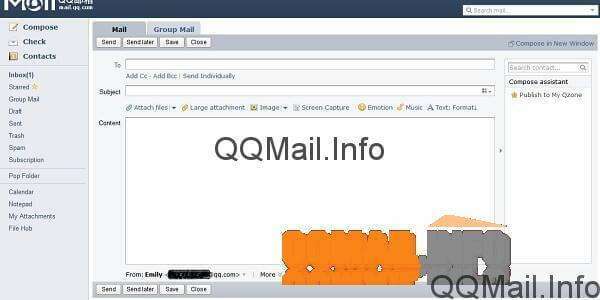 How does QQ Mail work? 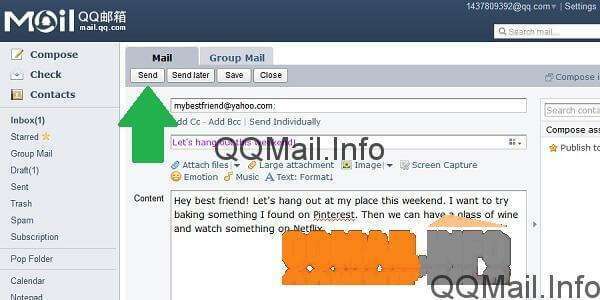 QQ Mail has a very simple interface, but it essentially works exactly the same as any other free email service like Yahoo, Gmail or Outlook. When you register for an email address, you’ll get a familiar-looking inbox with the ability to add contacts, send and receive messages, create email groups and send group messages, etc. 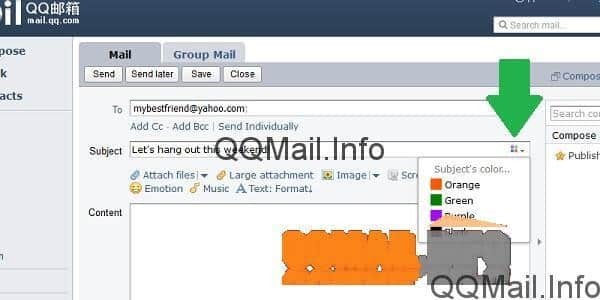 Although it is a very modern email service, it’s almost reminiscent of the old AOL or MSN accounts in that your qqmail email is automatically a username for QQ’s instant messenger. The difference being that, unlike your old AOL account, qqmail has options for voice and video chat, and pretty much everything else you would expect from an advanced email platform these days. 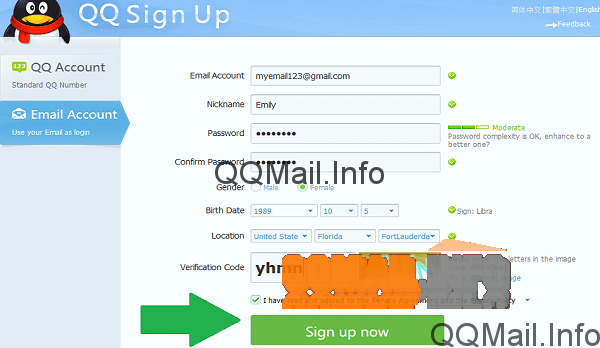 What are the benefits of a QQ Mail account? QQ is a whole lot more than email. If you’ve heard of the Chinese company Tencent, basically everything they own and operate falls under the QQ umbrella, either directly or indirectly. 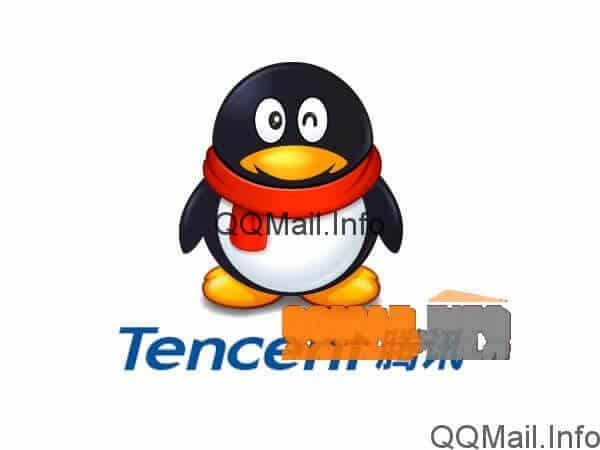 The QQ ID or account number that makes up your qqmail email address can also be used to access almost any other part of the Tencent/QQ universe. Now, some of these features aren’t going to be practical for a majority of users outside of China because some are only offered in Chinese. But if you’re committed to the idea, you can use an automatic translator extension in a browser like Google Chrome and survive just fine. This would be helpful if you’re interested in connecting with people on QZone, China’s Facebook equivalent. A relatively new feature that proves QQ?? is aware of its own global expansion is automatic translation of instant messages. 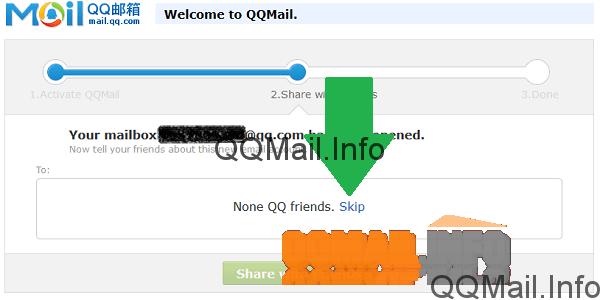 For anyone doing business in China who doesn’t speak Chinese, this may very well be the best part about having a qqmail account. Something that everyone can enjoy, however, is linking a QQ ID to the messaging app WeChat. 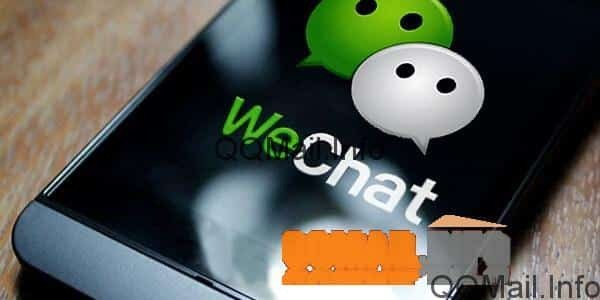 If you aren’t already using WeChat, it’s also owned by Tencent and pretty similar to other apps you might be familiar with, like LINE or WhatsApp, at least for users outside of China (there are about a million and one things you can do on WeChat inside China that you can’t do outside the country). There are some people who are interested in signing up with WeChat, but don’t want to have their mobile phone number linked to the account for whatever reason. 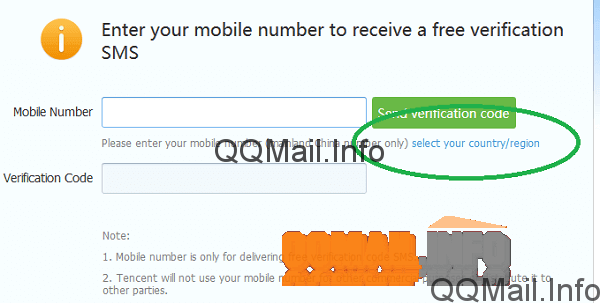 While the exact requirements to sign up for WeChat do change from time to time, if there’s ever any way to get around the phone number requirement, it will be with a QQ Mail ID number. 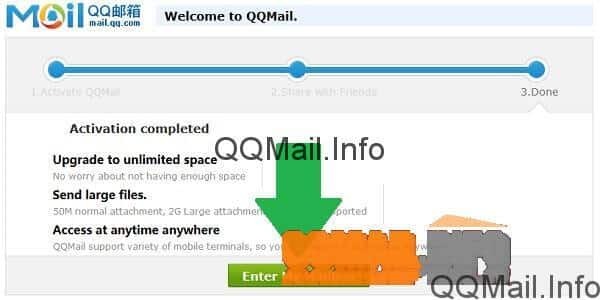 Signing up for QQ Mail can be a little tricky for users outside of China, so make sure you check out our post on how to create a qqmail account.